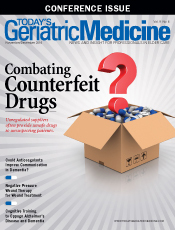 Many older adults, unable to afford necessary medications, access unregulated drug suppliers that provide impure or unsafe drugs to unsuspecting patients. Could Anticoagulants Improve Communication in Dementia? Effective atrial fibrillation management shows promise for improving cognitive and communication difficulties. For patients with dementia symptoms, consider ruling out atrial fibrillation as a contributing factor to cognitive decline. A comprehensive group of challenging activities targeting reaction time, visual spatial acuity, attention and concentration, memory, language, and problem-solving has met with success in improving communication and interaction among patients with Alzheimer's disease. With significant success, negative pressure wound therapy improves recovery rates of difficult-to-heal wounds such as decubitus ulcers. 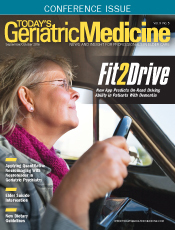 A newly developed and internet-accessible mobile application predicts pass/fail results of an on-the-road driving test for older adults with memory concerns. Neuroreader, a new software program, assesses hippocampal volume, providing valuable information related to the accurate diagnosis of Alzheimer's disease. Based on the newly developed 2015–2020 guidelines, experts offer recommendations on dietary patterns designed for optimal nutrition among older adults. High rates of geriatric suicide require that providers become familiar with screening, education, and prevention strategies. 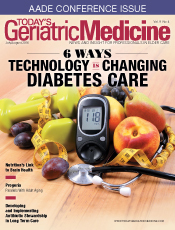 Innovative products promise new strategies for treating type 2 diabetes. Implementing antibiotic stewardship in long term care requires leadership, education, commitment, accountability, and documentation. The resulting reduction in antibiotic resistance benefits patients, staff, and the community. Studies suggest a diet rich in antioxidants, phytochemicals, and the B vitamins may promote cognitive function in older adults. Research indicates progeria is comparable to normal aging with respect to cellular signaling pathways. Older adults presenting in emergency departments (EDs) are unique among patients, often requiring specialized care and treatment. 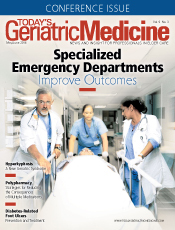 Medical professionals who have designed and launched a geriatrics-friendly ED describe the challenges in and benefits of a customized ED. For 20 years, hyperkyphosis, a thoracic spine curvature that often goes undiagnosed and untreated, has been the research focus of Deborah Kado, MD, MS. Geriatrician Diane L. Schneider, MD, MSc, discusses with Kado the importance of recognizing and treating the condition. Routine comprehensive foot examination and risk assessment are essential to preventing diabetes-related lower extremity complications and formidable foot ulcerations. Conducting medication reconciliations at care transitions, eliminating duplicate medications, assessing for drug-drug interactions, and reviewing dosages can reduce the incidence of polypharmacy, ensure patient safety, reduce hospitalizations, and decrease associated costs. 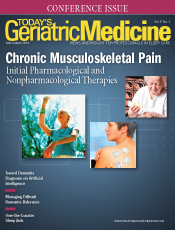 Increasing incidence of harmful side effects and medication interactions associated with prescription medications have led to growing support of the use of over-the-counter medications and nonpharmacological multimodal therapies to treat chronic musculoskleletal pain. Successful strategies employed in addressing undesirable dementia behaviors include ensuring needs are met, using reassuring language, changing environments, and engaging in soothing activities. Caregivers must employ patience and persistence to identify clues to undesirable actions. Difficulty sleeping is a common complaint among significant numbers of older adults. Providers must carefully assess patients, their specific complaints, and the risks and benefits related to possible remedies. Specialized interventions can help to reduce older adults' fear of falling, which can result in reducing the incidence of falls. 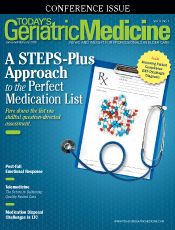 Careful question-directed assessment of patients' medication lists can often pare down the number of medications and ensure that the benefits of medications outweigh the risks. Elderly patients can develop symptoms or behaviors as a result of a fall. The resulting fear of falling can affect patients' physical, emotional, and psychological conditions. Telemedicine in skilled nursing and long term care facilities can help reduce hospital readmissions and foster improvements in collaboration between hospitals and nursing homes.